There is no question of the achievements of Yana Hashamova in this vivid publication on post-Soviet cinema and I see Pride and Panic as an important development in scholarly writings in this area. This development is not without its problems (and I will return to these later), but the signs are that the study of post-Soviet cinema is moving forward – thanks to scholars like Hashamova. Expecting academic works that aim at capturing a nation’s cinematic spirit, we are usually treated with the celebration (and apprehension) of the emergence of the national(istic) cinema of Russia, e.g. Anna Lawton’s Imaging Russia 2000 (1). In other works, we read about the transition of Soviet cinema to post-Soviet Russian cinema in books which omit the former Soviet republics from their narration, e.g. David Gillespie’s Russian Cinema (2) or The BFI Companion to Eastern European and Russian Cinema (3). While Pride and Panic repeats the pattern of the latter works (4), Hashamova’s book advances the discipline in its approach to post-Soviet Russian cinema. The aim of Pride and Panic is “to uncover the desire or unconscious processes behind” post-Soviet filmmaking (p.10), in order to examine how the cinema copes with the broken illusions and wounded national pride caused by the onslaught of Western influences. It is no coincidence that Hashamova has the aim of unearthing “desire” and “unconscious processes”, because her theoretical framework is taken from psychoanalysis and, in particular, from the British school of psychoanalysis and Melanie Klein’s theory of object-relations in childhood and adolescence. According to this school of thought, the period of childhood is vital in the formation of the self (the “I” or the ego) as it is here that relations to others (foremost, to the mother and family) are discovered. Adolescence, however, is the period which Hashamova uses to dissect her chosen films, since it is in the behaviour of troubled teenagers that she finds a resemblance of contemporary Russian cinema and its relation to the West. Hashamova safeguards herself by stressing that she has no intention of painting the West in the position of adulthood or as the parent of an unruly, misbehaving youngster. And I share Hashamova’s concern about having the West at the top of a cinematic hierarchy, which is not fruitful for understanding trends in Russian cinema. That said, there are other implications when approaching national anxieties and pride by a developing/evolving analysis. While Hashamova is able (quite skilfully, it has to be said) to analyse Russian cinema’s growth into maturity, my question is: what exactly is maturity in this regard? Sameness with Western cinema or just not Russian nationalism? Hashamova’s analysis is divided into five chapters, each dealing with the relationship of Russian cinema to the West. In her first chapter, Hashamova examines the Western Other through the nexus of self/other, which has existed throughout centuries in the debate between Slavophiles and Westernisers. In the films she analyses, the Russian self goes in search of the Other in order to explore the changes in Russian identity from the fall of Homo-Sovieticus to the formation of a new Russian national identity. The films analysed are early post-Soviet Russian comedies (e.g. Okno v Parizh [Window to Paris, Yuri Mamin, 1994]), in which travel abroad and the encounter with the Western Other envision a reassessment of the Russian self. Hashamova argues that, in this period, Russian national identity is in flux, which is evident through an immature dialogue between self and other. In other words, in this stage the image of the Other is unclear and hence the projections are about self (as in childhood). Having established how Russian cinema in the early 1990s seeks a dialogue with the West, Hashamova can then move on to the rise of the Russian hero in the “blockbuster filmmaking” of Aleksei Balabanov and Nikita Mikhalkov (5). Often quite aggressive towards the West and defensive of Russia’s national identity, these filmmakers have become pinnacles of the rejection of Western influence. Hashamova interprets this as part of the adolescent defence mechanism of “understanding the world in extreme divisions of good and bad” (p.40). In its adolescent period, Russian cinema exhibits aggressive projections, while also idealising the self as unique and different from the West. This ties in nicely with Hashamova’s next chapter, which concentrates on the unearthing of history as a source of identity-formation. One film which serves Hashamova in painting the past as the conduit to Russian identity is Aleksandr Sokurov’s Russkiy kovcheg (Russian Ark, 2002). In terms of her Lacanian approach, Sokurov’s film fits Hashamova’s analysis, because its historic gaze (object a) is revealed as unreliable in the construction of a national identity. Instead, argues Hashamova, the film “unveils repressed and hidden aspects of Russian history, thereby deconstructing stereotypes and myths” (p.71). This is in contrast to Mikhalkov’s Sibirsky tsiryulnik (The Barber of Siberia, 1998), which is seen as being “too visual”, offering a surrogate of object a and thereby denying the unconscious “kernel of Russian national identity” (p.69). While it is fruitful to align these two representations of Russia’s past, the view that some identities are more “real” than others is less productive. In my view, popular cinematic representations are as meaningful as experimental ones. What Hashamova’s psychoanalytic approach fails to recognise is the fact that these two films have different production values, cinematic styles, critical receptions, and targeted audiences. These differences, in my opinion, help shape their representations of history. Hashamova’s analysis in the following chapter is also hampered by the omission of considerations of context. In this part, she examines post-Soviet Russian films in which a sexual relationship with the Western Other is formed. The ability to form intimate partnerships is an important capacity in the transition from adolescence to adulthood, hence it is also an important part of Hashamova’s argument. The films examined here, however, are somewhat eclectically selected, including a film, The Quickie (2001), that was entirely produced outside Russia. Although directed by Sergei Bodrov, the film is a European co-production targeting popular Western audiences; it is not aimed at Russian viewers. This does not mean that it should be excluded from our focus – far from it – but that we need to understand, investigate and highlight the context from which its representations of Russian identities springs. Furthermore, in this section, I was disappointed by the exclusion of Interdevochka (Intergirl, Pyotr Todorovsky, 1989) (6), because, in my view, this film challenges Hashamova’s argument concerning gender roles in Russia’s relationship with the West (Russian-male-gaze/Western-female-object). It should be mentioned that Hashamova examines Frantsuz (The French Guy, Vera Storozheva, 2004), which differs from this common gender dynamic. Nonetheless, Hashamova’s eclectic selection process demonstrates that we set up an erratic national framework when dealing in post-Soviet Russian identities. For example, if The Quickie is inside our scope, what about Last Resort (Pawel Pawlikowsky, 2000) or Lilya 4-ever (Lukas Moodysson, 2002)? These “non-Russian” films also offer powerful portrayals of post-Soviet Russian identities, but from a different contextual viewpoint (7). In her last chapter, Hashamova explores symptoms of maturity in post-Soviet Russian cinema, drawing on films by Aleksandr Rogozhkin and, again, Balabanov. Her chief objective is to locate films that, in Lacanian terms, are “traversing the (national) fantasy” or, in Hashamova’s own words, films that “indicate an understanding of the complexity of the world in which Russia plays an ambiguous role” (p.97). Three films are the focus of analysis, of which only one is set in the contemporary post-Soviet context: Osobennosti natsionalnoy okhoty (Peculiarities of the National Hunt, Rogozhkin, 1995). The two others are set in pre-Soviet Russia – Pro urodov i lyudey (Of Freaks and Men, Balabanov, 1998) – and in Finland during the Second World War – Kukushka (The Cuckoo, Rogozhkin, 2002). In particular, the analysis of Balabanov’s Of Freaks and Men caught my attention, viewing, on the one hand, Russia as the victim of Western influence, but on the other, Russia as the victimiser of its own Eastern spur. Although these films show signs of maturity in their ambiguous recreation of a national identity located in the past, we should not take this as a linear or irreversible process. As Hashamova is quick to point out, “this does not mean that the Russian collective imagination has overcome adolescent impulses” (p.98). Thus, we are back to the question of what exactly are these stages of childhood, adolescence, adulthood and maturity? If adulthood and maturity are where Russian cinema abates nationalism, then I am not sure if post-Soviet Russian cinema will ever be able to be “adult”, preferring to be viewed as the unruly teenager constantly exhibiting its rudeness in the face of First Worldism. Pride and Panic does, in my view, make headway into understanding and explaining the reassertion of Russian nationalism in cinema, because it sees Russian cinema in relation to others/Others, which is uncommon within scholarship on Russian cinema. Notwithstanding this contribution to Russian film studies, rather than a psychoanalytical framework, post-Soviet Russian cinema would benefit from an examination that lays bare the contexts of filmmaking (exhibition forms, production economy, focused audiences, artistic aspiration, etc. ), which give rise to its cinematic imagination of Russian identities. 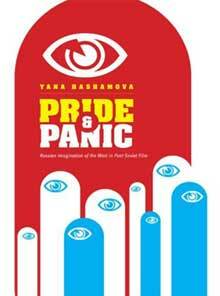 Pride and Panic makes a valuable argument and thereby develops the framework for analysing contemporary Russian cinema. However, there is still much work to be done in the field of cinema’s relation to Russia’s post-Soviet position(s). Yana Hashamova offers an important contribution and her analysis is recommended for all levels of interest in post-Soviet Russian cinema, from academic film scholar to cineaste. Pride and Panic: Russian Imagination of the West in Post-Soviet Film, by Yana Hashamova, Intellect, Bristol and Chicago, 2007. Anna Lawton, Imaging Russia 2000: Film And Facts, New Academic Publishing, Washington DC, 2004. David Gillespie, Russian Cinema, Pearson Education, London, 2002. Richard Taylor, Nancy Wood, Julian Graffy and Dina Iordanova (eds), The BFI Companion to Eastern European and Russian Cinema, British Film Institute, London, 2000. The “post-Soviet film” in the title of the book refers almost exclusively to post-Soviet Russian cinema and not to other, more marginalised, post-Soviet cinemas (e.g. Central Asian, Caucasian, Baltic cinemas). It should, however, be noted that considerations of post-Soviet cinema (in the fullest sense of the word) are starting to come into view, e.g. Elena Stichova (ed. ), Territoriia kino: postsovetskoe desiatiletie: kino stran SNG, Latvii, Litvy, Estonii, Pomatur, Moskva, 2001. Susan Larsen, “National Identity, Cultural Authority, and the Post-Soviet Blockbuster: Nikita Mikhalkov and Aleksei Balabanov”, Slavic Review, vol. 62, no. 3, Autumn, 2003, pp.491-511. Intergirl is judged outside the scope of Hashamova’s examination since it was not produced in the post-Soviet era. However, Hashamova grants other films made during the Soviet era a place, e.g. in describing the “Chernukha” film, Hashamova refers to Pavel Lungin’s Taksi-Blyuz (Taxi Blues), Georgi Daneliya’s Pasport (Passport) and Sokurov’s Krug vtoroy (The Second Circle). All three films were released in 1990 and hence are technically from the Soviet era. Fouling Intergirl on a technicality is a bit steep, in my mind, since it carries a hugely popular projection of the (Soviet/Russian) Other, which is not related to the US. For an example of comparing cinematic contexts centred around Russian identities, I humbly point to my own work: Lars Kristensen, “Divergent Accounts of Equivalent Narratives: Russian-Swedish Interdevochka Meets Swedish-Russian Lilya 4-ever”, Portal, vol. 4, no. 2, 2007, pp.1-22. Lars Kristensen is a PhD candidate in the department of Film Studies, the University of St Andrews, where he is researching cinematic representations of post-Soviet Russians abroad. He has taught Russian at the University of Glasgow, where he also completed his Masters of Philosophy on the Russian filmmaker Aleksei Balabanov.